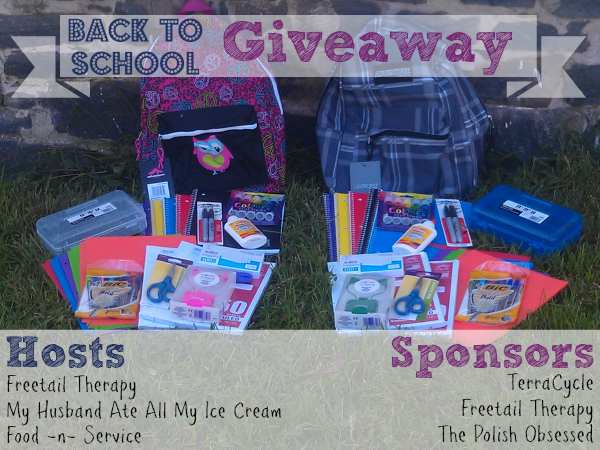 Welcome to the Back-to-School Giveaway hosted by Freetail Therapy, My Husband Ate All My Ice Cream and Food -n- Service. 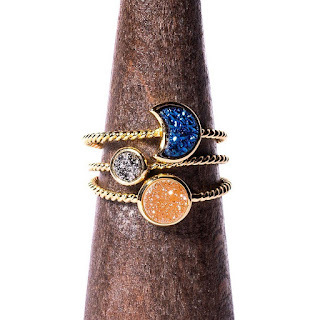 We are so excited to be able to offer this great giveaway! Getting those back to school supplies in order can be hectic. Reviewz & Newz is happy to be a part of this awesome giveaway for two stuffed backpacks filled with school supplies.. This giveaway will run from 9/1/13 to 9/14/13 and end at midnight EST. TerraCycle, Freetail Therapy and The Polish Obsessed are sponsoring this fantastic event, please show them some love on their facebook pages. PRIZES: ONE (1) Grand Prize winner of a stuffed backpack, as shown above, plus Skittle mini speakers, Kool-Aid Jammers Grape pencil case, and a Doritos notebook (shipped separate from the backpack). Grand Prize winner gets first choice of boys or girls backpack. ONE (1) First Prize winner of a stuffed backpack, as shown above. First Prize winner will get the backpack that was not chosen by the Grand Prize winner. the one with the peace signs, my daughters love peace signs. Either backpack would be fine as i have a son and daughter. We can always use the extra supplies. The plaid one would be perfect for my nephew! The owl backpack for my daughter. How cute is that backpack?! The blue plaid one because I have a son! I love both of them, as I have many grandchildren, and either would make one of them extremely happy! I would like to win the owl backpack because my daughter could use it when she goes to school! I would like the owl back pack for my niece.